Quick, a disaster has occurred and you only have sixty seconds to pick up items for your survival! 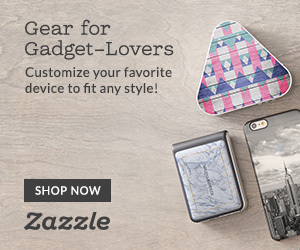 Many would grab their most valuable possessions and forget the survival essentials. When a disaster strikes, Your Survival Tools are What-You-Know, What-You-Have-on-You, or what you can reach. 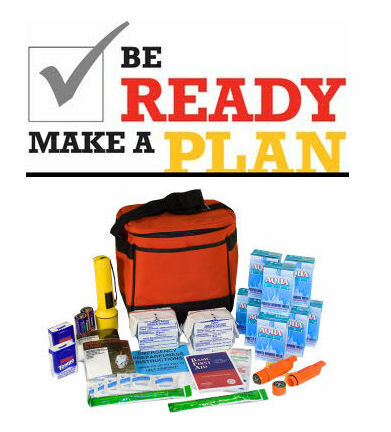 If you were to have an emergency are you prepared? What kind of an emergency could we find ourselves in? If could be anything from unemployment to the “big earthquake” that we are overdue for. How will you survive? I do not predict any impending disaster. I hope there will not be one. But prudence should govern our lives. Everyone that owns a home recognizes the need for fire insurance. We hope that we will never have to use it. Never- the- less we pay for insurance to cover a catastrophe, should it occur. We ought to do the same with reference to family welfare. We can begin ever so modestly. But I feel that so many of us feel that a long- term food supply is not within our reach so we make no effort to do this….The best Welfare Program is our Own Welfare Program. Five or Six cans of wheat in the home are better than than a bushel in the Welfare Granary. Floods, hurricanes, earthquakes, are all too common in the United States and elsewhere. Mother Nature can be very unpredictable. If you are prepared and have the proper supplies on hand then it will help to eliminate some of the stress while you are trying to recuperate from an emergency situation. Food Storage and other aids are important to keep up-to-date and have for survival. 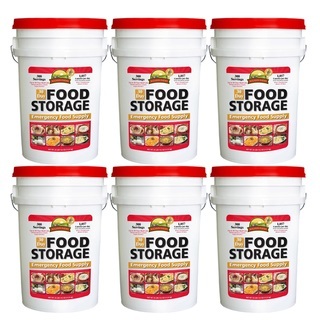 Sometimes creating a food storage supply can be overwhelming. A basic kit that you need is a 72- Hour kit. Having a 72-hour kit available for each individual in your family can be a life saving item. Our family has our 72-hour kits in backpacks. We have ours right outside our garage door. 2. Does your family know what to do before, during and after an earthquake or other emergency situation? 6. If a water line was ruptures during an earthquake, do you know how to shut off the main water line to your house? 7. Can this water valve be turned off by hand wit out the use of a tool? Do you have a tool if one is needed? 9. It you smell gas, do you know how and would you be able to shut off this valve? 12. Do you have working smoke alarms in the proper places to warn you of fire? Carbon Monoxide alarms? 16. If you and your family had to evacuate your home, have you identified an outside meeting place? If an emergency lasted for 3 days (72 hours) before help was available to you and your family. 20. 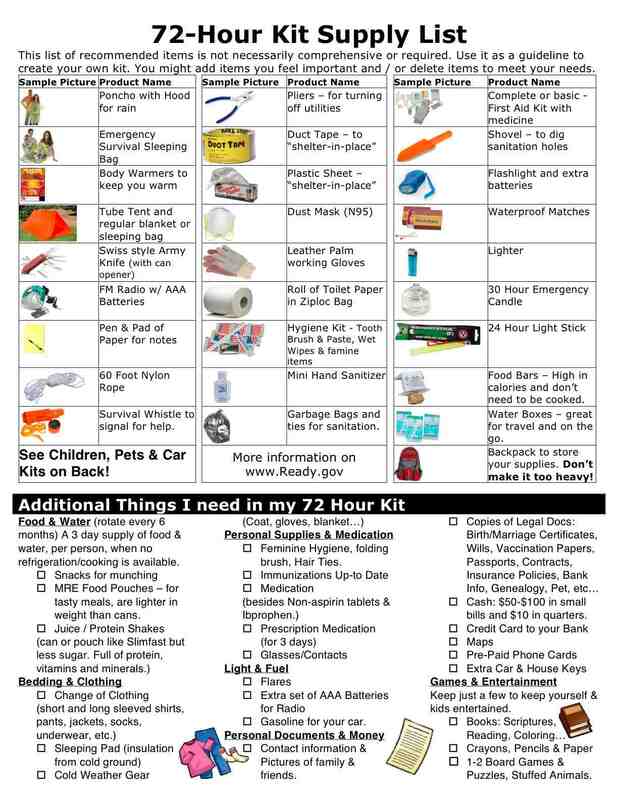 Do you have access to a 72-hour evacuation kit? 22. Have you established an out-of-state contact? 23. Do you have a first aid kit in your home and in each car? 24. Do you have work gloves and some tools for minor rescue and cleanup? 29. Do you have a supply of food, clothing, and fuel where appropriate: For 6 months? For a Year? The 72-Hour Emergency Kit should be individually tailored to meet the basic survival needs of your family for three days. 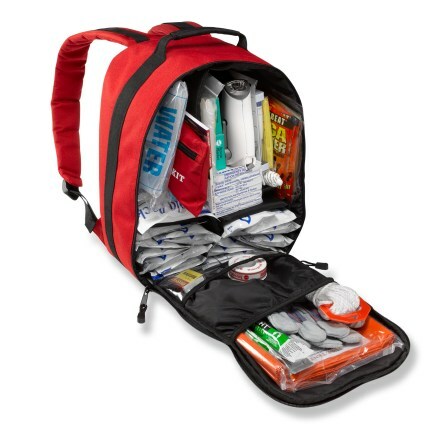 Your kit is not to live off of through the duration of a disaster, It should sustain you until help arrives. You may be wondering, “Why the 72 hour kit and not the 24 hour or 32 hour kit?” After an emergency situation, it usually takes approximately 72 hours for an outside party to reach victims. You may need to survive on your own after a disaster. This means having your own food, water, and other supplies in sufficient quantity to last for at least three days. Local officials and relief workers will be on the scene after a disaster, but they cannot reach everyone immediately. You could get help in hours, or it might take days. Basic services such as electricity, gas, water, sewage treatment, and telephones may be cut off for days, or even a week or longer. Or, you may have to evacuate at a moment’s notice and take essentials with you. You probably will not have the opportunity to shop or search for the supplies you need. 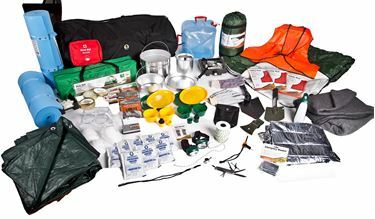 A disaster supplies kit is a collection of basic items that members of a household may need in the event of a disaster. Remember to rotate your perishable supplies and change water as needed for freshness. An asterisk (*) next to an item means “for each family member”.Remember: Check the kit every few months to be sure your supplies are fresh! 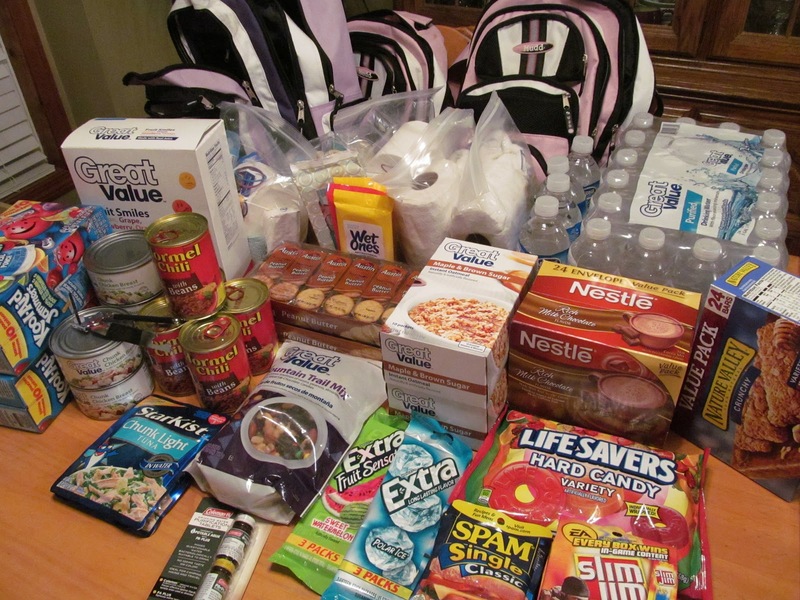 Create a Family Disaster Supplies Kit…….. Decide where you will store supplies (food may be packed together in a single container or kept on shelves for easy rotation. Explain how to prepare; explain when and how to respond. Discuss what to do if you need to evacuate. So where should you Store These Emergency Kits? Store grab-and-go food and water container where easy to access in case you are advised to evacuate. Children and adults keep their emergency kits in there bedrooms. Let the children have responsibility for their own backpack and have the older children buddy-up and take care of younger brothers or sister. Mom and Dad take care of baby. If a senior citizen resides with the family, also buddy-up and help them for they move slower and a backpack may be too heavy for them to carry. Don’t forget house pets should also have emergency kits to be ready to grab-and-go. What is your alternate route? What must you take with you? Select based on your family’s needs and preferences. Pick low-salt, water-packed varieties when possible. Canned Meat: Tuna, chicken, ravioli, chili, beef stew, spam, corned beef, etc. 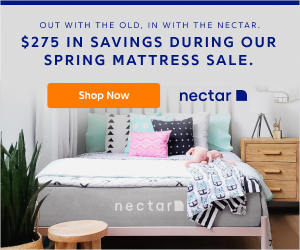 Start out small, unless you have a couple hundred thousand in the bank (which I don’t think you do, I don’t either) you can’t go out and buy everything right away. Start out with a 72 hour kit, look at what you would need for three days to eat, drink, wear (season dependant) for everyone in your family. I would recommend a big backpack with all of this so if things are bad you can just grab it and go and not spend 3 hours rummaging around boxes in the attic to find the camping container “you know is up here somewhere”. Remember to rotate your supplies as needed for freshness. For water, plan to have one gallon of water, per person, per day! Pets should be counted also when figuring water. ALSO: extra hearing aid batteries if needed. 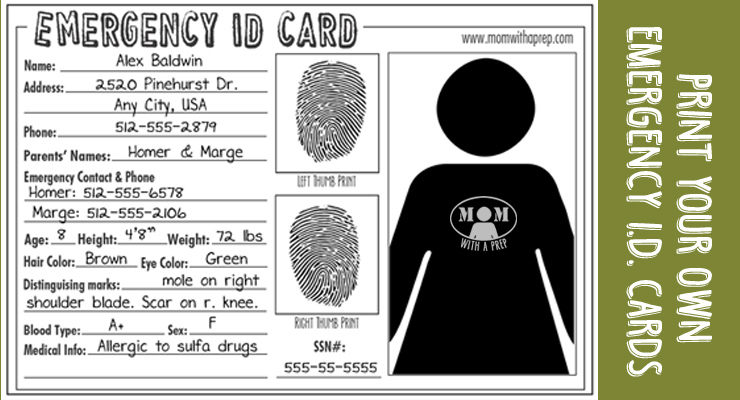 Do you have Emergency ID Cards with Pertinent Information about your children for them to carry in their school emergency kits, your emergency bags or even their pockets when on a field trip? Check out this Free Printable from Mom with a PREP. The Volcano Stove II is a tri-fuel stove, meaning you can use propane, charcoal, or bio-fuel to cook your meal – See more at: http://americanpreppersnetwork.com/entry/using-a-dutch-oven-with-the-volcano-stove#sthash.3kDQSG8g.dpufThese are things that would be great to have near your 72 hour kit, but are too big to fit inside a backpack. A great gift to give this season is a Gift Of Emergency! Water Storage Inforgraphic……Water Storage Should Be an Important Part of Your Emergency Storage!